Exclusive: Many on the American Right insist federal actions from the Civil War to recent banking regulations were encroachments on states’ rights and personal liberties, but underlying these claims in the 1860s and today is the greed of the richest 1 percent treating the 99 percent as chattel, writes Mark Ames. A little over a year ago, while researching the Confederacy’s economy, I stumbled across this unnerving graph charting the value of America’s “stock of slaves” in the last decades before the Civil War. From afar, if you didn’t know that human “slave stock” was the asset being charted, you could easily mistake this graph, and its parabolic trajectory, for one of the many destructive asset bubbles this country has suffered right up through our own time. 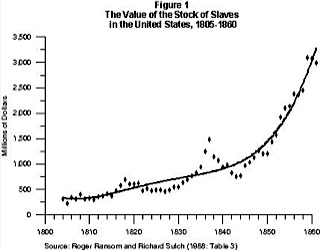 Up close, this graph drips greed, mass murder and shame, it strips away the historical revisionism that falsely ascribed the South’s “cause” to an almost selfless, tragically romantic attachment to “tradition” and “culture”; it gives lie to the myth that slave owners kept their slaves to the detriment of their own bottom line. Like the worst wars and the worst of history’s villains, the Confederacy’s one percenters seceded and fought in order to continue profiting from their most valuable investment properties, their human slave stock. The graph comes from a grim working paper, “Capitalists Without Capital,” written in the late 1980s by a UC Berkeley economist, Richard Sutch, and a UC Riverside historian, Robert Ransom. As they showed, slavery produced huge profits for southerners who invested in slave capital, to the detriment of all other portfolio investments, as the value of slaves soared in the mid-19th century. By that time, by far the largest cotton-growing states’ wealth was in slave stock, not in real estate or other investments. The slave trade was outlawed in 1808; but the slave population quadrupled from 1 million in 1800 to 4 million in 1860, encouraged by slaveowners who “bred” their human stock, thereby multiplying their profits as the value of each slave rose. What makes this graph so disturbing for us in 2012 is what it suggests about today’s “1 percent”, and how they view the rest of us. It gives form to the brutal crackdown on the Occupy protests, and suggests darker things to come as we try to free ourselves from their vision of civilization, and our place in it. Contrast that with this McKinsey report put out a few years ago by the director of the consulting group’s New York office. Titled “The New Metrics of Corporate Performance: Profit Per Employee,” the report argues that the best performing firms in our increasingly financialized era are those companies that have learned to squeeze ever-larger profits out of each employee, and not by the more traditional “return on investment” metric. As with slave stock in a Southern investor’s portfolio, the McKinsey report argues that as a corporation learns to successfully extract rent from its employees, the more employees it extracts rent from, the greater its aggregate profits. To compare “the 99 percent” to African slaves would be crude; but the mindset of “the 1 percent” then, as now, is eerily consistent. They view the rest of us not as human beings with rights, but as livestock whose meat is “rent” to be extracted. This is the language of plutocratic capitalism, a brutal system totally incompatible with democracy and antithetical to republican government and civilization. It is the language of misery, and misery is what “the 1 percent” is promising “the 99 percent” for years to come, in ever-greater doses. Is IAEA Greasing Skids to Iran War? The U.S. press corps has embraced the integrity of the International Atomic Energy Agency as central to the case for bombing Iran. But WikiLeaks documents revealed how the IAEA’s new leader is a pawn of the West, and Gareth Porter explains at Inter Press Service how the IAEA has escalated the confrontation with Iran. The first detailed account of negotiations between the International Atomic Energy Agency and Iran last month belies earlier statements by unnamed Western officials portraying Iran as refusing to cooperate with the IAEA in allaying concerns about alleged nuclear weaponization work. The detailed account given by Iran’s permanent representative to the IAEA, Ali Asghar Soltanieh, shows that the talks in February came close to a final agreement, but were hung up primarily over the IAEA insistence on being able to reopen issues even after Iran had answered questions about them to the organization’s satisfaction. Soltanieh took the unprecedented step of revealing the details of the incomplete negotiations with the IAEA in an interview with IPS in Vienna last week and in a presentation to a closed session of the IAEA’s Board of Governors March 8, which the Iranian mission has now made public. The Iranian envoy went public with his account of the talks after a series of anonymous statements to the press by the IAEA Secretariat and member states had portrayed Iran as being uncooperative on Parchin as well as in the negotiations on an agreement on cooperation with the agency. Those statements now appear to have been aimed at building a case for a resolution by the Board condemning Iran’s intransigence in order to increase diplomatic pressure on Iran in advance of talks between the P5+1 and Iran. Soltanieh’s account suggests that Amano may have switched signals to the IAEA delegation after consultations with the United States and other powerful member states which wanted to be able to cite the Parchin access issue to condemn Iran for its alleged failure to cooperate with the IAEA. Parchin had been cited in the November 2011 IAEA report as the location of an alleged explosive containment cylinder, said by one or more IAEA member states to have been used for hydrodynamic testing of nuclear weapons designs. The detailed Iranian account shows that the IAEA delegation requested a visit to Parchin in the first round of the negotiations in Tehran Jan. 29-31 and that it asked again at the beginning of the three “intercessional” meetings in Vienna for such a visit to take place at a second negotiating round in Tehran Feb. 20-21. Soltanieh recalled, however, that during three “intercessional” meetings in February with IAEA Deputy Director General for Safeguards Herman Nackaerts, and Assistant Director General for Political Affairs Rafael Grossi, the two sides had reached agreement that the IAEA request for access to Parchin would be postponed until after the Board of Governors meeting in March. But when the IAEA delegation arrived Feb. 20, it renewed the demand to visit Parchin, according to Soltanieh’s account. “At the beginning of the meeting the first day, they said the director general had instructed them to give a message to us that they wanted to go to Parchin today or tomorrow, despite what we had clearly agreed two weeks earlier,” Soltanieh told IPS. Soltanieh told the Board of Governors that the negotiating text on which the two sides were working at the Feb. 20-21 meeting provided specifically for a visit to Parchin as well as other sites in conjunction with Iran’s actions to clear up the issue of “hydrodynamic experiments” the allegation by an unnamed member government published in the November 2011 IAEA report. In response to the renewed request for a visit to Parchin, Soltanieh offered to let the delegation visit the Marivan site, where the same November report said the agency had “credible” evidence Iranian engineers worked on high-explosives testing for a nuclear device. “We offered Marivan because it was the next priority,” Soltanieh told IPS, referring to the list of priority issues on which Iran was expected to take actions to be specified by the IAEA under the provision of the negotiating text. But the IAEA delegation rejected the offer, claiming that it had been given too little time. Soltanieh’s account reveals that the IAEA also turned down a request to stay one additional day to complete the negotiations of the new action plan. “At lunch hour the second day, we wanted them to stay another day,” he told IPS, and the delegation told them it might be possible. But after consulting with Amano, the IAEA delegation said it could not stay. In the end, no resolution was passed by the Board. Instead the P5+1 the U.S., Britain, France, Russia and China plus Germany – issued a joint statement urging Iran to allow access to Parchin but not blaming Iran for the failure to reach agreement. The negotiating text as it stood at the end of the February round of talks, which Soltanieh showed IPS, had relatively few handwritten deletions and additions. The primary issue standing in the way of final agreement, according to Soltanieh, was whether the IAEA could reopen issues once they had been resolved. The text shown to IPS includes a provision that IAEA “may adjust the order” in which issues were to be resolved and “return” to issues even after they had been resolved. The other major issue, according to Soltanieh, was Iran’s demand that the IAEA “deliver” all the intelligence documents alleging that it had carried out covert weaponization activities to Iran before asking it for definitive answers to the allegation. The IAEA delegation said they couldn’t produce all the documents at once, he told IPS. Iran then agreed that the agency could provide only those documents relevant to each issue when it comes up, the Iranian diplomat recalled. It is not clear, however, whether the IAEA has agreed to that compromise. The United States has refused in the past to agree to turn over the “alleged studies” documents to Iran a policy that Amano’s predecessor, Mohamed ElBaradei had argued made it impossible to demand that Iran be held accountable for explaining those documents.